Located near the center of Austin, on the square originally selected as the site of the Capitol of the Republic of Texas, the State Capitol is more than just another building to Texans throughout the state: it represents a great part of our heritage. The Capitol is the result of the hard work of many individuals who had the wisdom and determination to see Texas stand proudly as a state in the Union. The contract to construct the present Capitol was signed on January 1, 1882. A groundbreaking ceremony one month later, on February 1, 1882, signaled the start of construction. The cornerstone, which is located at the northeast corner of the Capitol, was laid on March 2, 1885. The Capitol was nearing completion when a dedication ceremony was held on May 16, 1888, and in September of that year, the building received its first occupants. The Capitol was officially completed on December 8, 1888, six years and ten months after construction began. Designed by Detroit architect, E. E. Myers who also designed the Michigan and Colorado Capitols, the Texas Capitol covers three acres of ground with approximately 18 acres of floor space or 192,374 square feet of available office space. When completed in 1888, the building contained 392 rooms, 18 vaults, 924 windows, and 404 doors. Approximately 566 feet in length, 288 feet in width, and 302.64 feet from grade line to the top of the star on the Goddess of Liberty atop the dome, it is the largest of all domed state capitol buildings and is second in total size only to the National Capitol in Washington, D.C. In fact, like several other state Capitol buildings, the Texas Capitol surpasses the National Capitol in height, rising 14.64 feet above its Washington counterpart. The Capitol's exterior walls are Texas red granite from Burnet County, while the interior and walls are Texas limestone. The roof, encompassing 85,000 square feet, is made of copper. The original floors were hand-blocked clay tile, glass, and wood. In 1936, a new floor was installed on the first floor to commemorate the centennial of Texas Independence. This floor, which remains today, is of terrazzo--mostly Texas marble aggregate. Interior walls are adorned with nearly seven miles of wainscoting made of oak, pine, cherry, cedar, walnut, and mahogany. Door and window frames are constructed of oak or pine, except for those in the Governor's Reception Room, which are made of cherry. The Capitol Extension, an underground addition to the main Capitol, is connected to the Capitol and four other state buildings by tunnels; it is considered to be a permanent part of the Capitol. The Extension opened to the public on January 11, 1993. 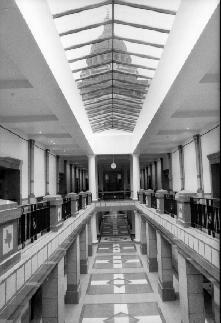 The Capitol Extension contains skylights, known as light courts, which allow a large amount of natural light in the the building and provide spectacular views of the Capitol dome. Most of the office suites have windows which open onto the light court, further heightening the spaciousness of the offices. The Extension contains 16 committee hearing rooms, 8 conference rooms, a large auditorium, cafeteria, and a giftshop. Each hearing room holds 75 to 100 people, and includes space for wheelchairs and the media. Most of the conference rooms are designed for small meetings, but the auditorium seats about 350 people and can be used for large functions.